So sorry it's been a while between posts! Summer is just such a busy time and seems like the time just flies! I hope this finds you all having a fun filled happy summer! I am heading off to Art Fiberfest and I wanted to post a quick "fiber" inspired tutorial before I left. 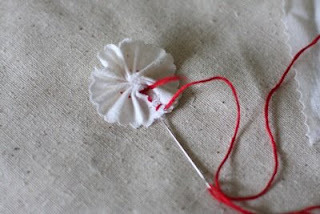 I am going to show you how to make a super simple card with a handmade fabric flower. This is the finished card that we will be making. 1. Two pieces of scrap fabric. Any kind will do! 4. A button or some sort of embellishment for the center. 6. 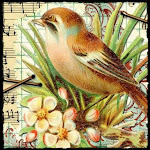 1 piece of cardstock to make a card your preferred size. 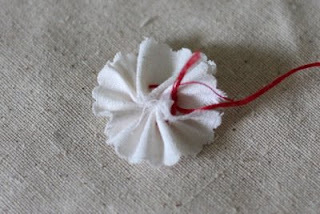 Cut your fabric that you will be using for your flower. Mine is about 6-7 inches long by about 1 inch wide. The bigger your fabric strip the bigger the flower. 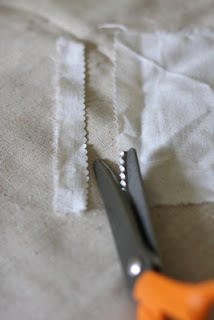 I cut the one edge with scallop scissors but you can tear yours if you don't have decorative fabric scissors. 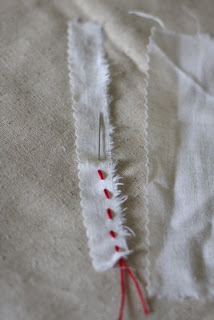 Sew a running stitch all the way down your strip on the non decorative edge. This will be the middle of your flower. 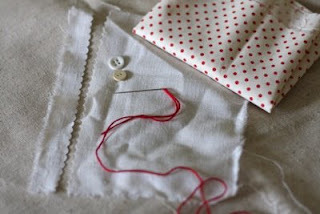 Pull your thread from the needle end to gather your fabric along the thread. Keep gathering until it forms a flower shape. Then tie a knot with both ends of your thread. 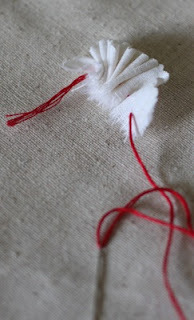 Then stitch the overlap of the petals together on the back side. I just did a couple of tiny stitches. Since your thread should match your fabric you won't be able to see them. 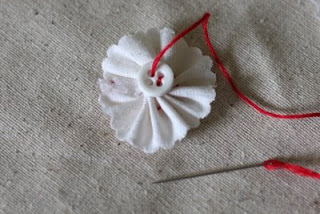 Sew on your button or glue any other embellishment you might have to the the center. 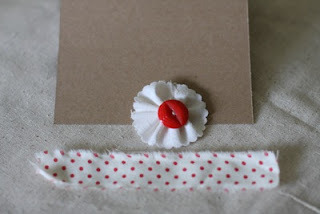 Now cut a second piece of fabric to fit across your card. I tore mine because I like the frayed look. 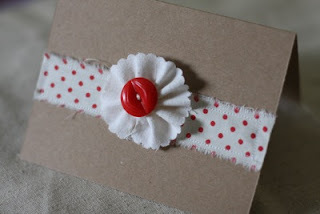 You can sew your fabric strip on the card or glue it. I like to sew for the extra texture. Then glue your finished fabric flower on top of the strip and you are done! This is great! Really simple to do, but it is very cute! Thanks so much. So glad to have some more wonderful tutorials to look forward to! SO GLAD YOU'RE BACK WITH TUTORIALS AND THIS IS GREAT. ONE OF THE SIMPLE ONES BUT AN AHA MOMENT TOO. HAVE A GREAT TIME AT FIBERFEST. Very cute! Thanks for sharing. Have fun at Art Fiberfest. 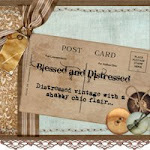 This is lovely...and I'm just starting to dip my fingers into sewing (ack! )I'm going to give this a whirl today. This is so sweet! 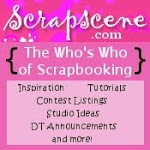 I cant wait to make one! TFS! Beautiful, easy to follow, and very cute. 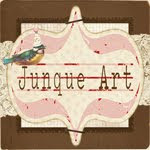 I'm a quilter/sewer, and also a cardmaker, so this project really appeals to me. Thanks for the great idea! This is just darling! What a helpful tutorial! Fun! I must take the time to play and do this! Thanks for the great instructions! Just popping in to let you know how much I enjoy your blog. I LOVE sharing and HOW To's. I recently did a blog on HOW To make clay roses, and if no one has done one, if you think your readers would enjoy it..I'd be happy to share it or you can go back to my June post and find it there, I think (lol)! sweet! Love the flower tutorial! adorable and very easy to follow tutorial! Flowers are the favorites to all of us. 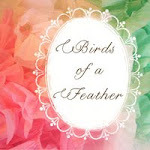 I usually do flowers shopping online, but this flower making tips can help us a lot. thanks for sharing.